Cary Greisch regularly performs in Luxembourg and other countries together with flutist Carlo Jans. Please use this form if you are interested in a flute and guitar recital. It was in 1986 that Carlo Jans and Cary Greisch teamed up for the first time as a flute/guitar duo before the Luxembourg public. This interesting and charming instrumental combination accommodates a broad repertoire consisting of original compositions as well as transcriptions. Works of the Renaissance and baroque era as well as of the classical and romantic periods are represented together with modern music of the twentieth century bearing the imprint of popular-folkloristic and avant-garde elements. 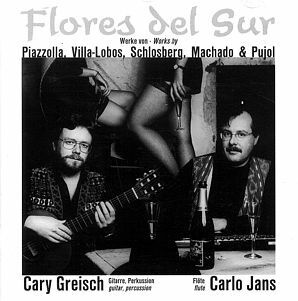 For more than fifteen years now the manifold tonal and expressive resources of a duo with flute and guitar have inspired Carlo Jans and Cary Greisch to present the fruits of their common labors to the public at home and abroad. Their first CD, entitled "Flores del Sur", was released at the beginning of the year 2000 by the label "Bella Musica" and contains Latin American music for flute and guitar.